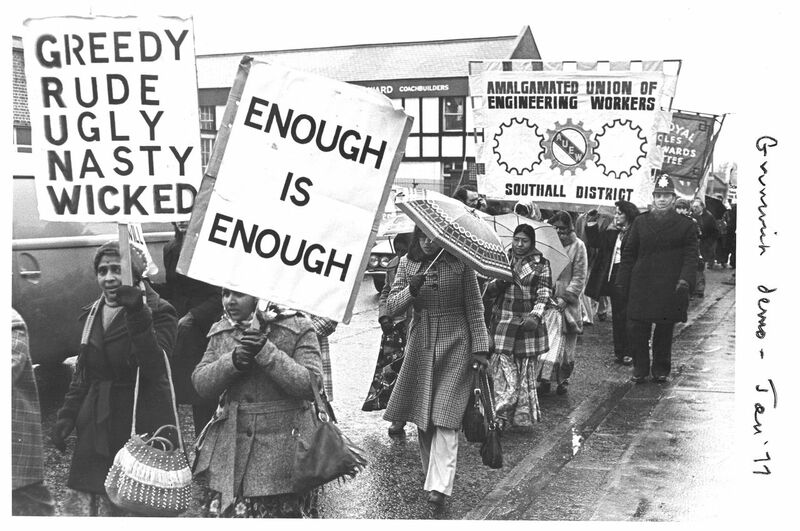 In 1976 South Asian women workers who had made Britain their home, led a strike against poor working conditions in a British factory. Lakshmi Patel was one of the South Asian women who picketed the Grunwick film-processing factory in north London for two years, defying the stereotype of submissive South Asian women. They gained the support of tens of thousands of trade unionists along the way. Lakshmi talks to Farhana Haider about how the strike was a defining moment for race relations in the UK in the 1970s. took part in the strike. claimed was un fair treatment. They also wanted to join a Union. will improve at Grunwick once we’re allowed to join a Union. had seen many of her colleagues treated poorly. sit in that room. He would observe us from that room, he would keep an eye on us. were afraid of the supervisors and couldn’t do anything about it. give me my card straight away, and I walk out. meeting to draw up a list of grievances. poor working conditions, and being forced to do overtime. walk out, she was determined that they stay out for as long as it took. Until we finish this dispute. And she was not scared of nobody. other Trade Unions who began to advise them. Here’s Trade Unionist Jack Dromey. office workers, mostly all the Unions supported us. drove straight in scattering pickets’ MPs and police. than a film processing plant. led by Jayaben visited him in hospital with a cake to apologise. dispute. In an effort to defuse the situation and inquiry was set up by the government. street, and only Jayaben Desai was in the middle. There is no doubt, I can say that the victory is nearer. some concessions had been won, as she explained in an BBC interview. can’t get a 100% victory can you? so hard for their rights. University of Lincoln who has studied the Grunwick strike in great detail. relations, how would you see the importance of Grunwick? Union recognition of minority and migrant women workers’ rights. with the Unions then wanted to adopt their case. The tactics did vary. on the Trade Unions to withdraw their support. gradually turned away from them, and that’s why the strike was lost. just for themselves but for all of us British workers. picket line, and I must say that the BBC is part of that, of Strikers in Saris. This surprise that how come women are doing something that we see as unexpected. the tag Strikers in Saris was not unjustified. being listened to by the broader Trade Union movement. turned to her and said You Grandma? I can’t believe you went on strike. created a website with resources for schools and a comic.